Mark Hamill | Cinema, etc. Kathleen Kennedy introduced a special panel yesterday at Star Wars Celebration Orlando 2017 yesterday. The entire day can be streamed online, as can today’s as it happens in Orlando, but the panel above is well worth a watch. George Lucas was there! Harrison Ford was there! Mark Hamill was there!!! 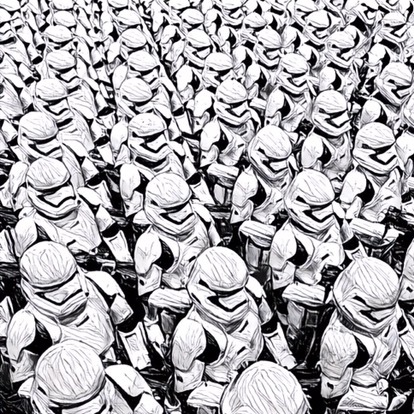 Oh, there’s also Dave Filoni, Liam Neeson, Ian McDiarmid, Hayden Christensen, Samuel L. Jackson, John Williams, Anthony Daniels, Peter Mayhew, Billie Lourd and Billy Dee Williams. All hosted by Warwick Davis. Just watch it. The atmosphere looks electric. 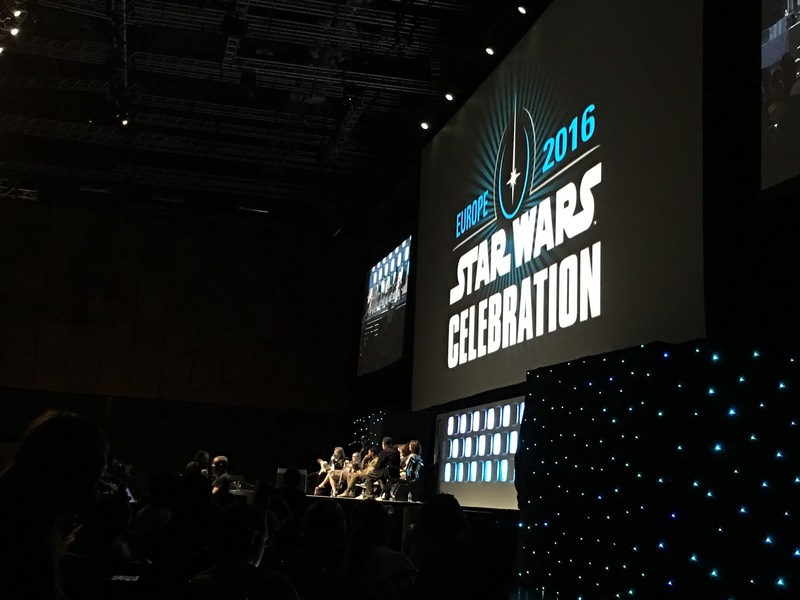 Today was the third and final day of the Star Wars Celebration Europe event in London, and they really saved the best to last. In the build up to the hugely popular final panel, there was plenty on offer to keep even the most exhausted Star Wars fan happy. Trumping even Anthony Daniels on the bizarreness levels, Carrie Fisher (with her equally loving and loved pet dog Gary Fisher) joined Warwick Davis on stage for an hour-long interview. Or so we thought. The real star of the show was Gary, and at times I wasn’t sure which one Warwick was having more time keeping an eye on. This exhibit was a VR experience that was exactly what it says on the tin. Clearly this technology is in its infancy in terms of how general public will interact with what they see on the headset goggles, but it was a fun way to spend 15 minutes and provided a glimpse of the fun to come. If someone can work out an affordable way to put it in everyone’s living room they’ll make a lot of money. There was so much discussed here that I put it in a separate article. Well, two actually with a third on the way. 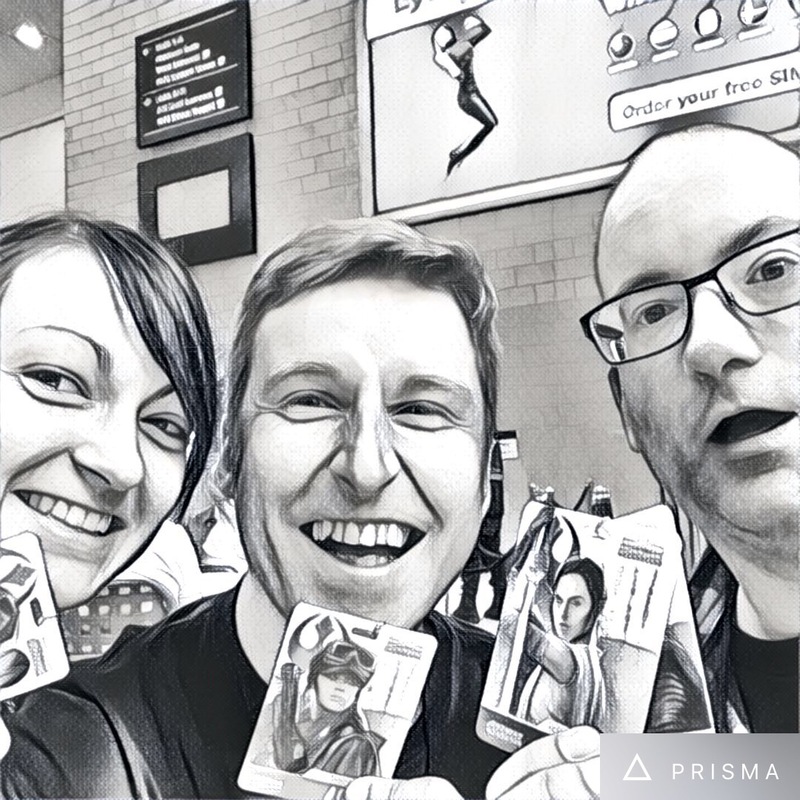 Star Wars Episode VIII – What did we learn at SWCE? And with that, Warwick Davis concluded the proceedings and the mad dash to the exit doors commenced. For a lifelong Star Wars fan, this weekend was a dream come true and if you can afford it it’s something you should try at least once. 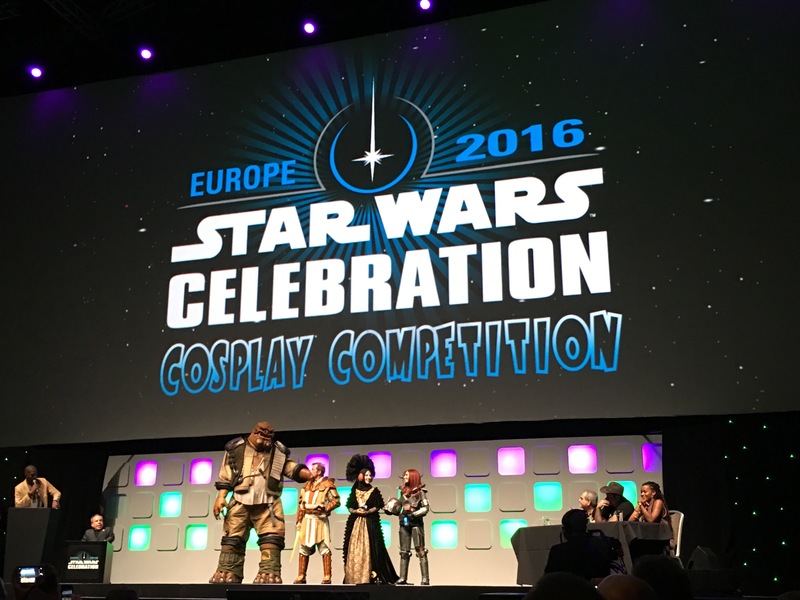 So day one of the Staw Wars Celebration Europe in London is complete and it has been a ridiculously good day. Whilst the highlight was the Rogue One trailer reveal and panel discussion, the rest of the day was literally a joy for all those in attendance. Cosplay is a mixture of costume dress-up and role playing, and has become a permanent fixture of the Celebration events and similar weekenders. The cosplay competition was this year won by an excellent 9ft take on Grungar. I spoke to the creators and it took over 100 days to complete. In many ways, it is better than the costume from the movie, which itself couldn’t stand up and be moved around. Across the board, it was phenomenal to comprehend how much time had collectively been poured into the competition. Even those that weren’t in the top 3 in their categories were great efforts, especially a near-perfect Kylo Ren. An hour with Hamill was never going to be enough and it was sad to see him go. The format was simple – he just had people line up and ask him questions until we ran out of time. There were some fascinating questions, not just about Star Wars but also his successful voice acting career, and his responses were candid and revealing. At one point he confirmed the long-standing rumour that the opening scene of Episode VII was his hand floating through space holding a lightsaber. Cool? I think so. I hope the whole discussion is made available some day soon. Want cool free things? Just walk around. There’s plenty there. My favourite was a Dengar Top Trumps card. I’m evidently easy to please. I did spend some money too. I’ll be wearing my awesome German-language The Empire Strikes Back (or is that Das Imperium Schlägt Zurück?) t-shirt tomorrow for day two! !